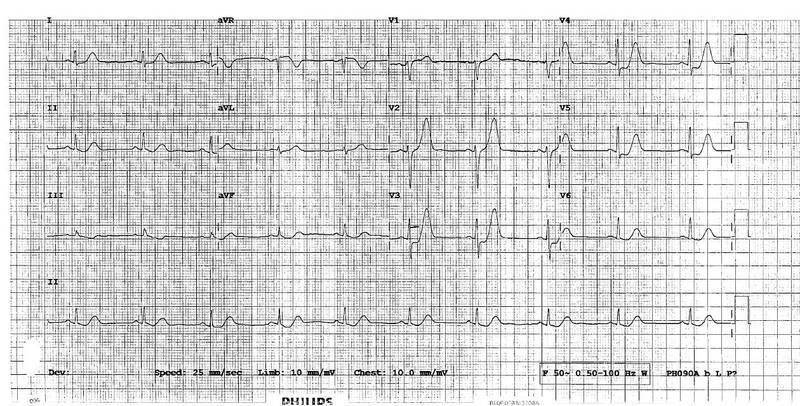 STEMI equivalents can be tricky and a source of ED-Cardiology friction. I’ve gone through my collection to find some great examples, and I thought it might be a good idea to refresh some of the new kids on the block signs of coronary artery occlusion . click on the ECGs for big pictures. 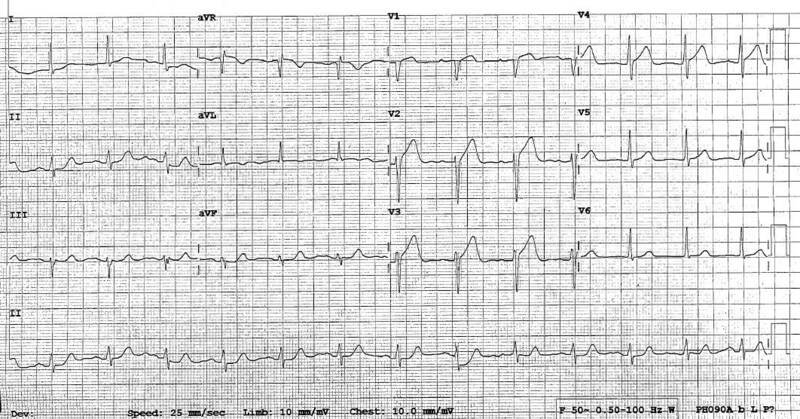 This ECG is of a 39 year old man and clearly has STE in leadV 1-V3, although its the upsloping variety in V2-3. the TWs are huge – Fat – not skinny and thus not hyperK, they are classic hyperacute TWs. The TW in V4 is a classic DeWinters TW: a big TW with upsloping STD. aVR shows STE and there is widespread STD. 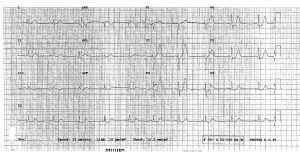 This ECG is of another young man (45) and shows the classic deWinters TWs (huge with upsloping STD) . Note the subtle but present STE in aVR and mild inf-lat STD. This guy had had a brief VF arrest before arrival. At eventual angio he had a 100% prox LAD . Taken to the lab by an excellent young cardiologist who was happy that these dynamic hyperacute TWs constituted LAD territory ischaemia. Prox LAD at angio. 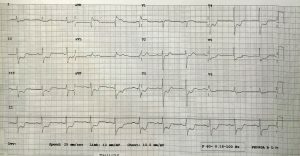 76 M with palpitations is this a STEMI? 83F with palpitations, and a #NOF. 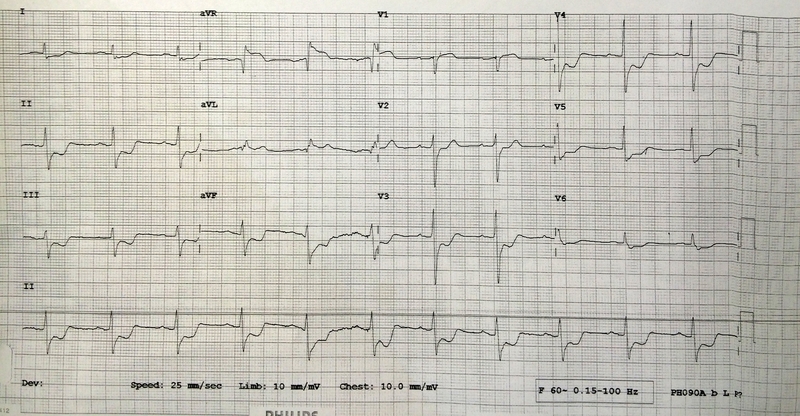 Is this a STEMI? aVR essentially ‘looks at’ the basal LV septum and is 180 degress opposite to to inf leads I and II. Firstly a true Left Main (LMCA) STEMI is very rare in the ED, as most die before arrival. Having said that, in Sri Lanka, we saw heaps..including some in complete heart block , most of whom died in ED after lysis failure. aVR STE in these patients is a very bad prognostic sign . Proximal LAD is more common and more survivable. Note the aVL elevation which supports this as it means that the first diagonal is occluded. NSTEMI causing aVR STE can be from non occlusive Left main disease or , often, triple vessel disease if the STD is widespread. Here, the worse the disease, the more STD you get. This amount of STD then can predict for bad outcome/ need to have CABG. Remember that aVR is the reciprocal, so its amount of ST elevation in aVR is clearly going to also predict the above. 2) In both STEMI and Non-STEMI, the degree of STE in aVR correlates with worse disease and worse outcomes; these patients should be referred for ASAP cath. 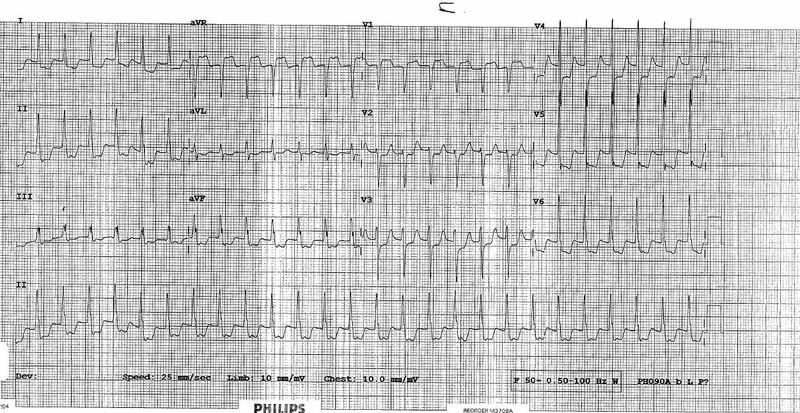 These are hyperacute septal T waves with associated upsloping ST depression . 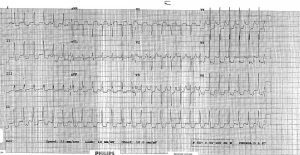 They are also seen with mild (0.5mm) ST elevation in aVR, and are another STEMI equivalent. . About 2% of patients with LAD occlusion have these. 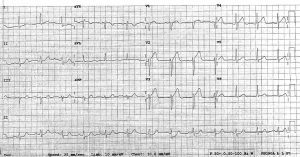 They may progress into “full STEMI” but usually don’t improve. Thus they are different to Wellens (biphasic TW) and Hyperacute TWs that commonly evolve/resolve and usually don’t represent 100% occlusion. Associated with younger, dyslipidaemic males – I wonder if this is because they commonly would have a single culprit lesion with better collateral supply and more resilient myocardium so they dont get the full transmural infarct STE pattern. Verouden NJ, Koch KT, Peters RJ, et al.Persistent precordial “hyperacute” T-waves signify proximal left anterior descending artery occlusion. Heart. 2009;95:1701–6.